Watch this film, look me right in the eye, and tell me this isn't a fabulous world we are living in! We visited this special place, just last week- enchanting Doris Jenkins was at the entrance, she put our money in the register, she played "Elimination," she skated with us at the end of the evening; the wooden floor was just exactly as you see it, and you can go there too! I am absolutely ready to begin building my roller rink. I imagine it will be open for you to visit by 2020 at the latest. I hope you will come by! I think I will serve apple juice, and maybe popcorn.... Oh, and we will have Cheerwine for sale, too. And long lost candy bars, like Ice Cubes and U-No Bars and Rocky Roads and Abba Zaba. I simply cannot wait! On second thought, I guess the taffy might stick to the floor, so we can't have that last one! AI Don't know Nuthin' about the Finer Things. It’s car upholstery, it’s old nails; museum objects from around the world, Twombly, and Motherwell, and knitted holey sweaters, and shrubbery, and discarded lumber, and old envelopes, and pencil marks, and dripping paint on the edges of cans, it’s everything I ever saw, it’s everything that ever was: All this, synthesized. Is what an artist sees and tries to paint, to make, to build, to write & to play. Sometimes, here at the Dodo, we post an answer to a question that you may not realize you are asking, and in point of fact, it may be that very few of you are asking it, but the Dodo exists for these few- for you, in point of fact. They are making now, with their super-high-tech-plastic textile stuffs, stockings that do not run. The Brits call them ‘ladder resist,’ and I wonder if I will need to start to hoard the old kind, the kind that run, the kind that hold a record of wearing. Of course hosiery is fragile, and short-lived, but isn't this part of what we love about it? Would we have them 'wear like iron'? A woman, a girl, always works a bit to hide the early runs- with a longer skirt or boots, and often just the tiniest section of a run will show as a person turns, or leans. The run is a line that leads someplace you cannot see, and it is the most titillating part of stockings, and it is also the very end of them, the most precious last wearings. The run is especially lovely in black stockings, because it is the most visible. The wearer sometimes puts a daub of nail polish on the runs, the ladders, to stop them, and it might show as a red or pink dot on the stockings. The thing I am considering here, as I so often do, are the traces of time's fleetness, the ineffable marks of wear, and the very nature of being. May the mundane and short-lived continue to endure! A place you can go to plan or make manifest your hoard. 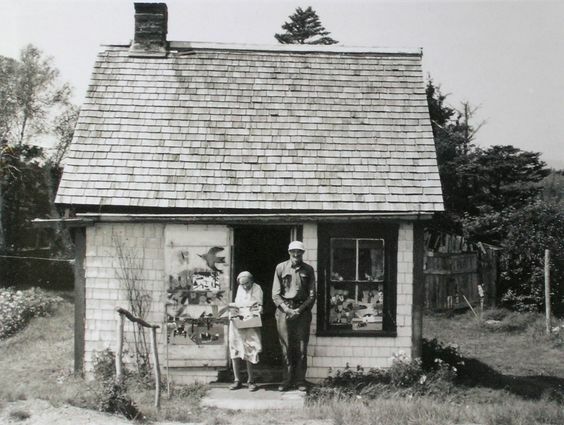 A bit more on the cottage, and a bit more on Maud Lewis herself. Here it is, the second in a series of ideas directed to me by People. It's a cheery little guerrilla printmaking project that has me looking at the scene under my feet with new eyes! Oh golly, it isn't on the regular Dodo schedule, but it is from People and it something you should see, so, here it is. Say, speaking of the f in feminism- have a look at this method of telling the world just what you think of it. I think you'll enjoy dreaming up two word phrases to consider for your collars! There is a song, for today, too- it's 11:59. The mailbag this week yielded a question you all must be dying to know the answer to: How do we come up with all those fine and compelling ideas and issues at the Dodo? The answer, dear Reader, is Soylent Green. Yep, it's people who bring the ideas to the Dodo. Just this week there have been three interesting things brought to my attention by People. I get around a bit, and I always have my Dodo pencil handy to jot down notes. Once I get back to the research lab onsite here at the Dodo, I do a few tests, a bit of reading, and voilà! Your fresh-baked post is ready and waiting for you! Today's interesting item brought to my attention by People is this web-based little optical illusion. Keep your eye on the next two posts, they came from People, too. Again, I can hardly believe my good fortune: see if you can credit it! There I am, minding my own business at my job, when someone asks me for some 'ideas'! Well, of course, I replied: Chantilly lace, and a pretty face, and a pony tail hanging down, .... and oh baby! you know what I like! I gave him the following ideas- I think they are fabulous, of course; really top drawer ideas; one of them is someone else's idea. I mean, that wingchair! What a doozy! A lilac velvet upholstered wingchair filled with a pile of pale river stones. A secret library in the trunk of a car. A map to the places the wee folk live. A minotaur courts a bower bird. Nine pairs of shoes & four mouse holes. An atm that dispenses cupcakes all night and day. News of the Old Ones.